For those of you that believe that the camping season ends on Labour Day, you are missing out on a great tradition, Thanksgiving in the provincial park. 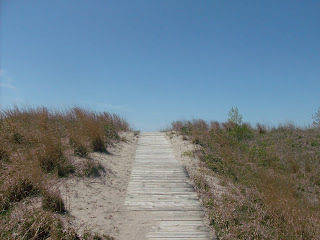 We have been fortunate to spent a couple of Thanksgiving weekends in Port Burwell Provincial Park and have never been disappointed. 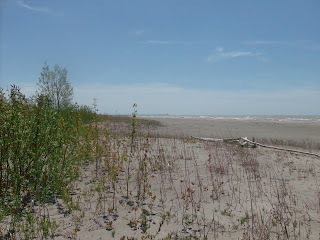 Port Burwell Provincial Park is located on the north shore of Lake Erie just south of Tillsonburg, Ontario. Being at the southern part of the province it tends to warm up quicker and stay warm longer making it an ideal destination at the beginning and end of the camping season. Arriving there on the Thanksgiving weekend, the first thing you will notice is the festive feel to the park. It has become a tradition on this weekend to decorate the sites and you will notice the presence of pumpkins, corn stalks and hay bales on many sites. The second thing you will notice is the smell. The first time I walked past a camp site where a turkey was being cooked in a deep fryer, I thought I had died and gone to heaven. I had to stop in to see what was cooking, and the campers were more than happy to show me and explain in great detail the process and how delicious the end result was. 1. Using a commercial turkey fryer, and following manufacturer's instructions, heat oil to 375°F. 2. Make sure the fryer is positioned well away from any children, teenagers, pets or flammable structures. 3. Make sure the pot is only partly filled to allow for the level of the oil to increase when the turkey is added. 4. You should also leave room to allow for the bubbling of the oil when the turkey is first added. 5. Judge the level of oil necessary by placing the raw turkey in the empty pot and covering it with an inch or two of water. Remove the turkey, mark the level and discard the water. 6. Mix spices and salt together and rub liberally over the outside of the turkey. 7. Gradually immerse the whole turkey into the hot oil a little bit at a time, giving the oil a chance to calm down before immersing more of the bird. 8. It's a good idea to wear heavy gloves and a long sleeve shirt for protection from the inevitable spattering of the oil. 9. Make sure to follow the manufacturer's instructions. DO NOT LEAVE THE TURKEY OR THE HOT OIL UNATTENDED. 10. Fry turkey for 3 minutes per pound. 11. Remove from oil and let stand for 15 minutes before slicing. So, don’t cut your camping season short. Consider including Thanksgiving weekend as one last adventure of the year, and include a deep fried turkey in your menu.